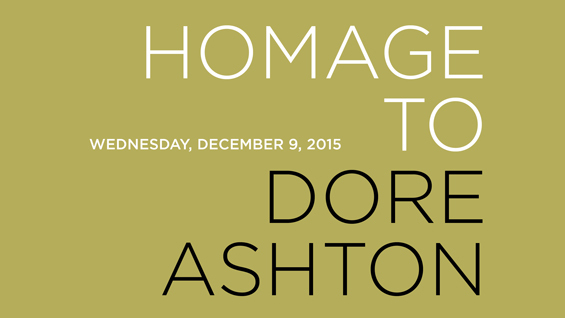 Celebrate the work of renowned art critic Dore Ashton through selected readings of her publications, short papers inspired by her writings and a new video by Alfredo Jaar. Please RSVP to Crystal Ortiz at cortiz@cooper.edu or 212-353-4269. One of the world’s most authoritative critics of modern and contemporary art, Dore Ashton is professor emeritus of art history at The Cooper Union for the Advancement of Science and Art. The recipient of many awards and recognitions including two Guggenheim Foundation Fellowships, Ashton has had a varied experience as art critic, author and teacher. She wrote and/or edited over thirty books on art including Noguchi East and West, About Rothko, American Art Since 1945 and Picasso on Art. Dore Ashton: Out of the Whirlwind – A Lifetime of Writing, an exhibition of books by Dore Ashton in the collection of The Cooper Union Library, is currently on view at the Library in conjunction with this event. The display will continue through December 18, 2015.